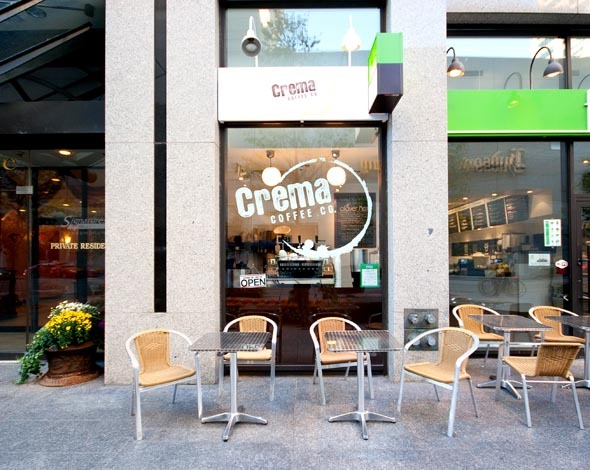 Crema, at Yonge and Bloor is in an area all on its own (in terms of artisanal coffee shops). The recently-opened cafe is Crema's second location ( the original is in the Junction ), and is squished into a small corner of a much more pervasive Freshii . 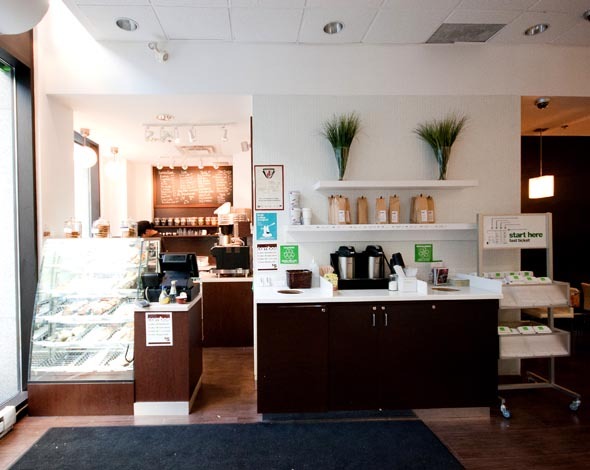 When I first walked in to the coffee shop, I was surrounded by people eating salads and drinking juices from Freshii; it is definitely a hard place to make yourself comfortable, and suggests that much of the clientele takes their coffee to go. Lots of stark white furnishings, and the counters of both Crema and Freshii make this space feel vaguely like a cafeteria. The food is displayed behind a nice, clean glass case, and is the first thing you see upon entering the store. 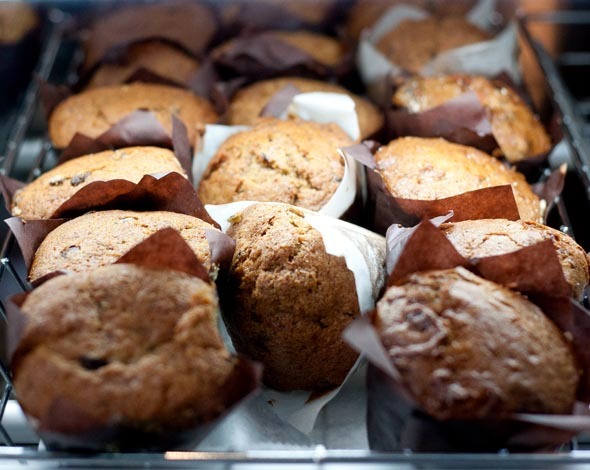 The food is sourced from a few different places, and represents a pretty typical selection of pastries to choose from: a few squares, the usual Toronto-indie-cafe muffins, croissants and a few different types of cookies. You can also, however, get a combo and have a drink from Crema with food from Freshii. This is a unique idea, and solves a common problem in coffee shops - stale and uninteresting food options. The first thing I tried, as usual, was a single shot. Seeing the Mirage machine with sawed-off bottomless portafilters, I was looking forward to a robust and rich shot, with beautiful crema on top. Instead, my shot had little crema, and based on the splash marks on the inside of the cup, I could tell was extracted too fast. Despite the way it looked, and despite the thin crema, the taste was pretty good. Using 49th Parallel's ''Epic Espresso blend,'' the shot wasn't as rich as I'm used to for that blend, and tasted as though the coffee needed more time to de-gas after being roasted, but offered a nicely-balanced and slightly sour shot. Beautifully branded cups and saucers, with a nicely polished spoon came with my shot, and definitely helped the coffee's case. Second I had a cappuccino, which was considerably better than the shot. The milk was steamed, in my opinion, to the perfect temperature. There really is nothing worse than scalded milk- something I'm finding increasingly prevalent in Toronto cafes. The slightly sour coffee was much better tasting with the milk of the cappuccino, although the balance between milk and espresso was slightly off, tasting like there was a little bit too much coffee and not enough milk in the drink. As the shiny Mirage machine behind the counter requires manual pre-infusion, I think it may be throwing off the taste of the coffee, pre-infusing for too long before the shot is pulled, and resulting in a shot that tastes slightly over-extracted. This is a minor criticism of the cappuccino however, which was far better than my shot. The real winner at Crema at Yonge and Bloor, by far, is the Clover coffee. Being one of only a few (independent) cafes in the city to have a Clover machine, having a coffee from it with the kind of precision and care taken at Crema, is a real treat. If I could suggest one thing from this espresso bar, it would be the Clover coffee by far. The barista was very precise in measuring the coffee before running it through the clover, and was very deliberate in his actions brewing my coffee. I had the Guatemalan, a single origin coffee, from the Clover, and it was everything I had hoped for - a crisp, clean, light and distinctly fruity cup of coffee. 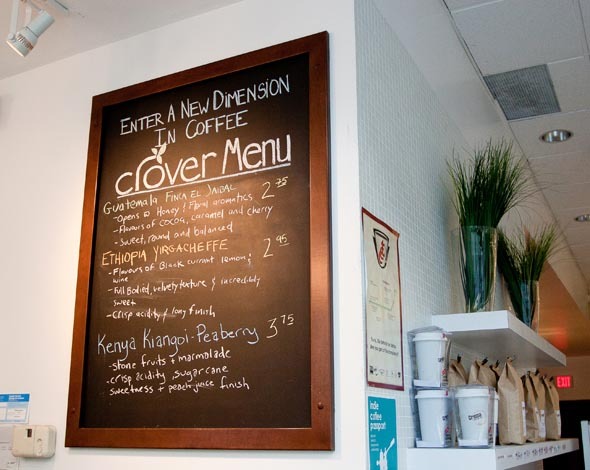 Currently, Clover machines are uncommon in the Toronto indie scene, and of the few that I've experienced, the Clover at this cafe is definitely the best. Though somewhat of an anomaly in cafes now, I suspect that Clover machines will soon grow tired in Toronto, as Starbucks bought the Clover brand and will be serving Clover coffee in many of its own cafes. Already, the Starbucks around the corner from Crema at Yonge and Bloor has a Clover machine behind the counter. All of the coffee used at Crema is from 49th Parallel , and is available for sale by the pound. With such beautiful equipment, it's too bad Crema is packed into the corner of this Freshii, giving the space a very cold and isolated feel. If this coffee shop were a little bit more open, or fit into the Freshii a little bit better, surely the environment would be more comfortable, and inviting. That being said, the cafeteria style of this espresso bar surely makes grabbing a quick coffee in the morning an easy task for morning commuters. My opinion: get the Clover, and get it to go.